Vatican City (AsiaNews) – An important and demanding declaration was published today by the Vatican and by representatives of the 138 Muslim scholars who wrote the well-known letter to the pope and other Christian leaders. Among other things, it affirms respect for life and for the dignity of each person, man or woman, which involves, among other things, respect for freedom of conscience and religion; the rejection of discrimination on account of faith; the importance of bearing witness through prayer to the transcendent dimension of life in an increasingly secularized world; an affirmation of the duty to give young people a solid moral, civil, and religious education, and teach them about the faith of others. The declaration also speaks of the possibility of creating a permanent mixed committee, and announces a second forum to be held within two years, in a Muslim majority country. 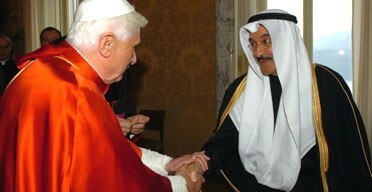 The Catholic-Muslim Forum was formed by the Pontifical Council for Interreligious Dialogue and a delegation of the 138 Muslim signatories of the open letter called A Common Word, in the light of the same document and the response of His Holiness Benedict XVI through his Secretary of State, Cardinal Tarcisio Bertone. Its first Seminar was held in Rome from 4-6 November 2008. Twenty-four participants and five advisors from each religion took part in the meeting. The theme of the Seminar was “Love of God, Love of Neighbour”. The discussion, conducted in a warm and convivial spirit, focused on two great themes: “Theological and Spiritual Foundations” and “Human Dignity and Mutual Respect”. Points of similarity and of diversity emerged, reflecting the distinctive specific genius of the two religions. 1. For Christians the source and example of love of God and neighbour is the love of Christ for his Father, for humanity and for each person. “God is Love” (1 Jn 4, 16) and “God so loved the world that He gave his only Son so that whoever believes in him shall not perish but have eternal life” (Jn 3,16). God’s love is placed in the human heart through the Holy Spirit. It is God who first loves us thereby enabling us to love Him in return. Love does not harm one’s neighbour but rather seeks to do to the other what one would want done to oneself (Cf. 1 Cor 13, 4-7). Love is the foundation and sum of all the commandments (Cf. Gal 5, 14). Love of neighbour cannot be separated from love of God, because it is an expression of our love for God. This is the new commandment, “Love one another as I have loved you.” (Jn 15, 12) Grounded in Christ’s sacrificial love, Christian love is forgiving and excludes no one; it therefore also includes one’s enemies. It should be not just words but deeds (Cf. 1 Jn, 4, 18). This is the sign of its genuineness. For Muslims, as set out in A Common Word, love is a timeless transcendent power which guides and transforms human mutual regard. This love, as indicated by the Holy and Beloved Prophet Muhammad, is prior to the human love for the One True God. A Hadith indicates that God’s loving compassion for humanity is even greater than that of a mother for her child (Muslim, Bab al-Tawba: 21); it therefore exists before and independently of the human response to the One who is ‘The Loving’. So immense is this love and compassion that God has intervened to guide and save humanity in a perfect way many times and in many places, by sending prophets and scriptures. The last of these books, the Qur’an, portrays a world of signs, a marvellous cosmos of Divine artistry, which calls forth our utter love and devotion, so that ‘those who have faith, have most love of God’ (2:165), and ‘those that believe, and do good works, the Merciful shall engender love among them.’ (19:96) In a Hadith we read that ‘Not one of you has faith until he loves for his neighbour what he loves for himself’ (Bukhari, Bab al-Iman: 13). 2. Human life is a most precious gift of God to each person. It should therefore be preserved and honoured in all its stages. 3. Human dignity is derived from the fact that every human person is created by a loving God out of love, and has been endowed with the gifts of reason and free will, and therefore enabled to love God and others. On the firm basis of these principles, the person requires the respect of his or her original dignity and his or her human vocation. Therefore, he or she is entitled to full recognition of his or her identity and freedom by individuals, communities and governments, supported by civil legislation that assures equal rights and full citizenship. 4. We affirm that God’s creation of humanity has two great aspects: the male and the female human person, and we commit ourselves jointly to ensuring that human dignity and respect are extended on an equal basis to both men and women. 5. Genuine love of neighbour implies respect of the person and her or his choices in matters of conscience and religion. It includes the right of individuals and communities to practice their religion in private and public. 6. Religious minorities are entitled to be respected in their own religious convictions and practices. They are also entitled to their own places of worship, and their founding figures and symbols they consider sacred should not be subject to any form of mockery or ridicule. 7. As Catholic and Muslim believers, we are aware of the summons and imperative to bear witness to the transcendent dimension of life, through a spirituality nourished by prayer, in a world which is becoming more and more secularized and materialistic. 8. We affirm that no religion and its followers should be excluded from society. Each should be able to make its indispensable contribution to the good of society, especially in service to the most needy. 9. We recognize that God’s creation in its plurality of cultures, civilizations, languages and peoples is a source of richness and should therefore never become a cause of tension and conflict. 10. We are convinced that Catholics and Muslims have the duty to provide a sound education in human, civic, religious and moral values for their respective members and to promote accurate information about each other’s religions. 11. We profess that Catholics and Muslims are called to be instruments of love and harmony among believers, and for humanity as a whole, renouncing any oppression, aggressive violence and terrorism, especially that committed in the name of religion, and upholding the principle of justice for all. 12. We call upon believers to work for an ethical financial system in which the regulatory mechanisms consider the situation of the poor and disadvantaged, both as individuals, and as indebted nations. We call upon the privileged of the world to consider the plight of those afflicted most severely by the current crisis in food production and distribution, and ask religious believers of all denominations and all people of good will to work together to alleviate the suffering of the hungry, and to eliminate its causes. 13. Young people are the future of religious communities and of societies as a whole. Increasingly, they will be living in multicultural and multireligious societies. It is essential that they be well formed in their own religious traditions and well informed about other cultures and religions. 14. We have agreed to explore the possibility of establishing a permanent Catholic-Muslim committee to coordinate responses to conflicts and other emergency situations and of organizing a second seminar in a Muslim-majority country yet to be determined. 15. We look forward to the second Seminar of the Catholic-Muslim Forum to be convened in approximately two years in a Muslim-majority country yet to be determined. All participants felt gratitude to God for the gift of their time together and for an enriching exchange. At the end of the Seminar His Holiness Pope Benedict XVI received the participants and, following addresses by Professor Dr. Seyyed Hossein Nasr and H.E. Grand Mufti Dr. Mustafa Ceriƒ, spoke to the group. All present expressed satisfaction with the results of the Seminar and their expectation for further productive dialogue.